Week of June 3, 2018 – Reds, I love them! My great grandmother loved red and she was a quilter. 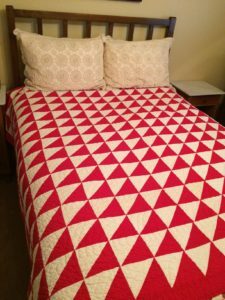 One of the quilts I have from her is a full size red and white half square triangle quilt. 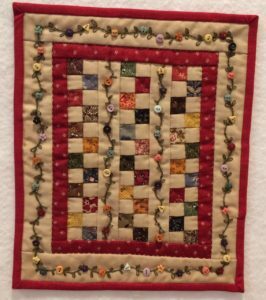 I think someone must have given her a bolt of red cloth because she used little pieces of the same solid red in her double wedding ring quilt, her 9-patch quilt and several others. It just kept showing up wherever she could add a small burst of red. Maybe that is why I like quilts with red in them. The biggest difference between us is that she hand pieced and hand quilted (with beautiful tiny stitches) her quilts. Mine are usually done on machine. I feel so blessed to have inherited several of hers. This little quilt (7.75” x 9.25”) is made with a pattern from the Red Button Quilt Company. I hand embroidered the green leaves and vines and then sewed on the adorable tiny buttons for flowers. I even hand quilted it. Maybe that is why it took me over a year to complete! I was very fortunate to find this next little treasure on E-Bay. I used to purchase lots of doll quilts from there, but since my collection is nearing 300 I try and not look very often. Imagine my surprise last month when I found this charming little embroidered red work quilt (11.25” x 13”). 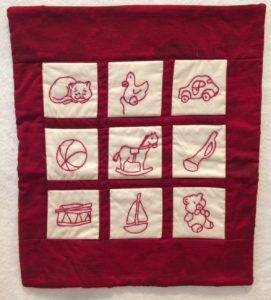 I can only imagine that a grandma made this for a small child and it illustrates nine cute little toys. Or maybe she just loved doing red work and she made it for herself to remind her of her own childhood. I love making up stories about quilts that come with no provenance. It gives my imagination some practice. 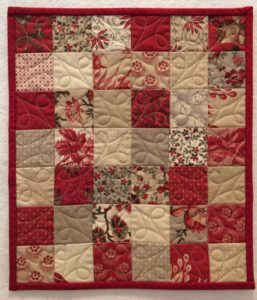 One more quilt with red that I want to share, is made from a Moda charm pack – Esprit De Noel with 2.5” squares. Sometimes even the simplest quilts can be sweet. I really like the tan and light gray that are combined with the reds and creams. You might want to consider adding a dash of red into your next quilt. Think of using it as Paprika – a little can go a long way. Or you might think of it as tomatoes in your spaghetti sauce – absolutely essential!